Not all loyalty programs are created equal. Learn how to strategically start building customer loyalty by choosing the right technology. As over half of Millennials say they are extremely loyal or quite loyal to their favorite brand, we know that customer loyalty is a major factor in many purchase decisions. And the most effective way to build customer loyalty is by establishing a connection with the end user of your product or service. But what if you don’t talk to your end user? If you’re in manufacturing or other B2B industries, brand loyalty remains a pain point, to say the least. You want to connect with your customers, but there’s a sales channels that gets in the way as you’re not the one talking to the end consumer. To spawn loyalty, you need to find a way to interact in a meaningful way with the end customer. D’Addario – the world’s largest manufacturer of musical instrument accessories - recognized this very need to engage in a conversation with their customers without disrupting the sales channel. Not all loyalty programs are created equal. While some out-of-the-box solutions may work for many situations, there are several others where a custom solution is needed. This was the situation that D’Addario brought to us. The first part to getting the strategy right was identifying the right technology. Magento Enterprise provided a solid foundation, allowing us to integrate with the necessary systems and scale multiple brands and international strategies. This powerful open source system gave us the flexibility we needed to create a dynamic user interface and the openness we needed to integrate with critical business technologies. Sweet Tooth Rewards provided a great technology but also a great partnership in designing the initial loyalty program so that we could engage first time users to join the program. Their expertise not only around their feature-rich extension but the strategic elements needed to launch a great rewards program was invaluable to the success of this project. 2) gather valuable analytics on customers such as buying behavior, consumption patterns, and how they advocate for the brand. 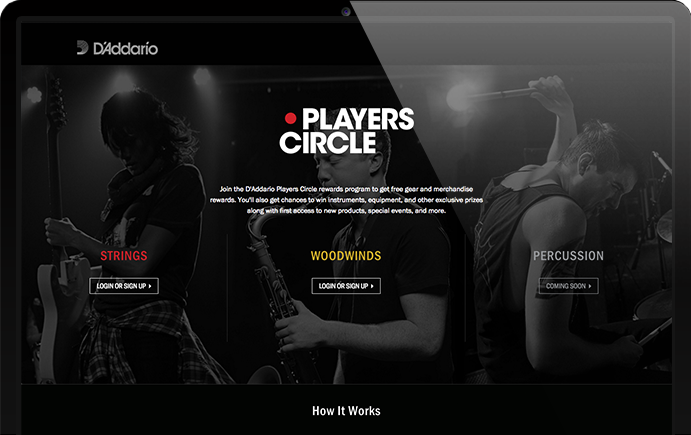 Together, D’Addario and Groove came up with Players Circle, a loyalty based rewards program where customers earn points that can be turned in for D’Addario branded merchandise. But since D’Addario sells to a niche market – passionate guitar players who are committed to furthering their journey as musicians – we knew that the loyalty program needed to have a little heart and soul associated with it. The search for soul birthed the recycling program and the donation option. Playback lets members earn points by recycling their instrument strings. The donation option gives members the opportunity to donate their points to The D’Addario Foundation – a non-profit organization that makes music education accessible in underprivileged communities. Since launch, the program has enrolled more than 20,000 members! We’ve seen roughly 30% of points donated to The D’Addario Foundation, and 106,000 strings have been recycled through Playback. By focusing on aligning the strategy with the right technology, we were able to collectively develop a program that gives D’Addario the opportunity to interact on a very real level with the musicians who use their world-class product every day. While building customer loyalty, D’Addario is also collecting invaluable information on their customers so they can better fulfill consumer needs in the future. 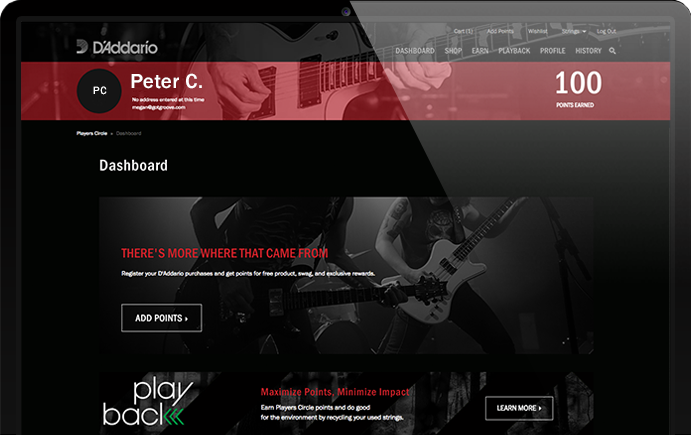 Check out this webinar where Pete Cerone of D'Addario, Steve Deckert of Sweet Tooth, and our very own Mack McGee discuss the strategy and custom features behind the Players Circle.